Now, for the first time, athletes from all sports and skill levels can easily learn and master the same Sport Psychology Training Skills previously only available to professional and Olympic-level athletes. Own the Game will provide you the hands-on tools necessary to increase your self-confidence, focus, concentration, and poise -ultimately allowing you to play to your highest athletic level! Dr. Christopher Stankovich, nationally acclaimed expert in the field of Sport Performance Science, will teach you the skills needed so that you can reach your full athletic potential! Maximize Your Athletic Ability! 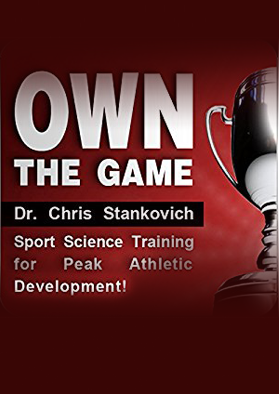 : Listen to Dr. Chris Stankovich discuss an overview of how improving mental toughness will immediately lead to maximum athletic development! Getting in the Zone: Learn about how to get “in the zone” so that your mind and body work in synchrony, resulting in consistent, peak athletic performances. Goal Setting: Every athlete needs a roadmap to follow for success, and proper goal setting techniques will help you minimize effort while maximizing results! Heart & Motivation: Athletes who play with “heart” regularly play above what others think they are capable of, and routinely make great plays in the clutch. Focus: Learn how to quickly minimize outside distractions and focus errors when competing, while dramatically improving in-game focus leading to on-field success. Imagery: Elite athletes know the importance of developing “muscle memory” through imagery, and now you can, too! Overcoming Anxiety & Choking: Learn why athletes “choke,” as well as simple tips and solutions so that pressure and anxiety will never again stop you from playing your best!